I've been looking for a product to emulate a WAN for quite some time now and I've seen many expensive hardware solutions and some software products that were way more expensive than yours. I like your product. It looks easy to use but functional and might be the one I was looking for. But before I go to my boss and yell at him "BUY THIS!" I wanted to clarify that your product can do what we want. We want to set up a test environment in our lab to test software AND hardware products. The way I was thinking about is setting up a server with two network cards and then using your product on the server to regulate the traffic. Would both of these clients be infected by high latency or packet loss or whatever I set up in the emulator? ...and why the hell is the icon for the network scanner a football/soccer ball??? In this scenario, it depends on how you stream your data. If it's between the server and either of the clients, you don't need two NICs. Just install the CE software on the server and it will affect all communications between the server and the clients. 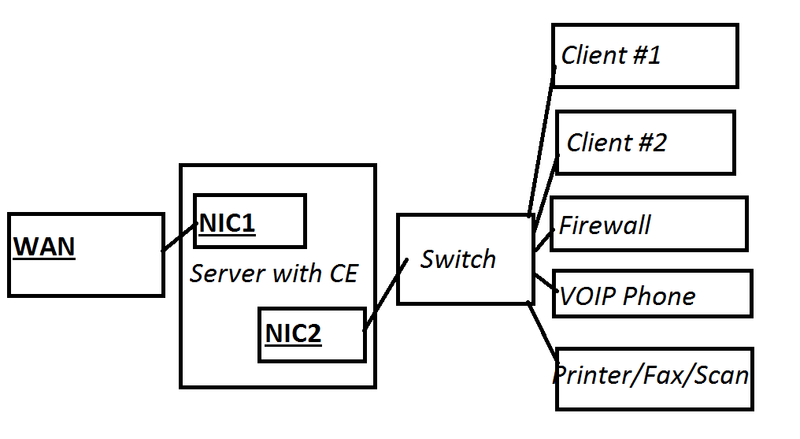 If however you want to affect traffic between the two clients, then yes you will need two NICs in the server, bridged with CE tools and each NIC connected to the respective client. You can think of CE as of a filter or firewall, where it affects traffic through a NIC on the computer it's installed on. Thank you for replying to my issue. You've said that I need two NICs and each of them connected to the client. This confuses me a bit. Does the client then need two NICs too? This way I could only affect one client each server and would be kinda bad for me. I want to affect a whole network with some clients and some hardware products like a switch or a firewall or a phone. Is that possible? I was talking to someone offering a boxed product for around 5000$ and he told me that there would be a way to do it with software but he was mumbling something about server and two NICs and saying it would be difficult blabla because he wanted me to buy the ridicilous expensive box. Sorry, I misunderstood your requirements. The scenario as in your diagram, can easily be implemented by getting a server with two NICs, one connected to the WAN, the other one to the LAN switch. Then you need to decide, how the server is to forward traffic between NIC1 and NIC2. I recommend to either enable Internet Connection Sharing if you are using a client OS like Windows XP, or the RRAS service, if you are using a server edition of Windows. Once you have got the server (host computer) up and running and your clients and hardware are able to access the WAN, then you can install CE and simulate losses, delays, etc. Once again, it will only affect the traffic between the WAN and LAN, not within the LAN. Kind of my last question for now just to make sure everything is clear. This way other devices (faxes, scanners, phones) wont get affected by the packet loss, delay or whatever right? Or can I set them the server with the two NICs as gateway or something so they have bad connection? Any device of computer whose traffic flows through the server with CE on it will be affected. Any local communications, that is those not flowing through the server will not be affected. I guess that's a no to faxes and phones.